Whether you need someone to watch your dog for a full day or a half day, rely on the locally owned and operated Paws Required! 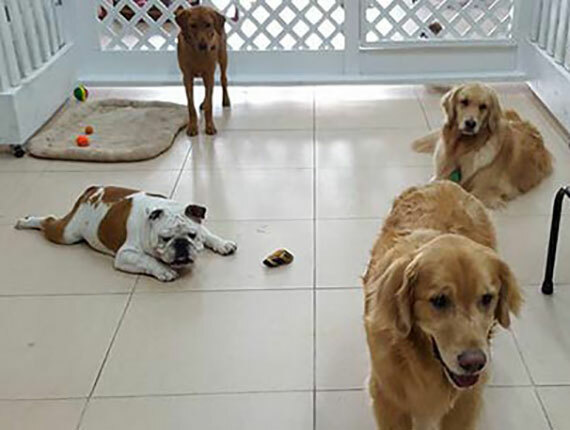 Your dog is welcome to come into our shop to socialize with the other pets and make friends at our doggie day care. Call 772-353-1457 for prices! No matter if you've got a large or small dog, all breeds are welcome at Paws Required. "Very nice place .... Brogan and Barbie loved spending the day. They look wonderful and smell great! Thank you so much!" If you are a dog owner who is occasionally out of town for work or pleasure then there is no reason why you should feel bad about this. In fact, by choosing Paws Required for your dog’s boarding needs, you are providing him or her with a holiday while you enjoy yours. At Paws Required we take great pride in the level of care and attention afforded to all dogs who stay at our premium boarding facilities. For us, the number one priority is to always treat our canine visitors as generously as possible, and thanks to the number of loyal clients who have returned to our service, we like to think that we are achieving this goal. One of the most common misconceptions that we hear regularly in our trusted pet care centre is that it is impossible to be a responsible dog owner and still take family vacations or occasionally leave town for work. This is simply not the case. Sure, if you are someone who works 18 hours a day and is out of town every second week then maybe this isn’t the time for you to get a dog. However, if it is only a few times per year, then there is no reason why you should feel bad for taking a break. The simple fact of the matter is that dogs are adaptable animals and while nothing will replace the love and warmth of their natural environment in your home, they can interact positively in other surroundings. This is particularly true if these other settings happen to have spacious sleeping areas and interactive activities throughout the day. At Paws Required we never settle for second best and you shouldn’t either. So, when it comes to giving your dog the best care possible there really is only one number to call. Our experience added to our constant desire to improve our service really is a winning combination and one that every dog should experience at least once. So, if you are going to be out of town soon, why not treat your four-legged friend to a boarding experience that will keep him or her happy and engaged and will leave your mind at ease. Call today to schedule an appointment or to learn more about our premium boarding service. Trust us, you won’t regret it.